If you have been following our recent featured item blogs, you may have seen the array of Mexican art curated for our November 9th sale. You may also be wondering where we acquired such a collection! Our consignor’s mother, who was from Mexico was a wealthy doctor in the region, who always sponsored Mexican art, often purchasing them before they were even famous. The vast majority, if not all of the contemporary, Mexican art has been acquired from this estate. 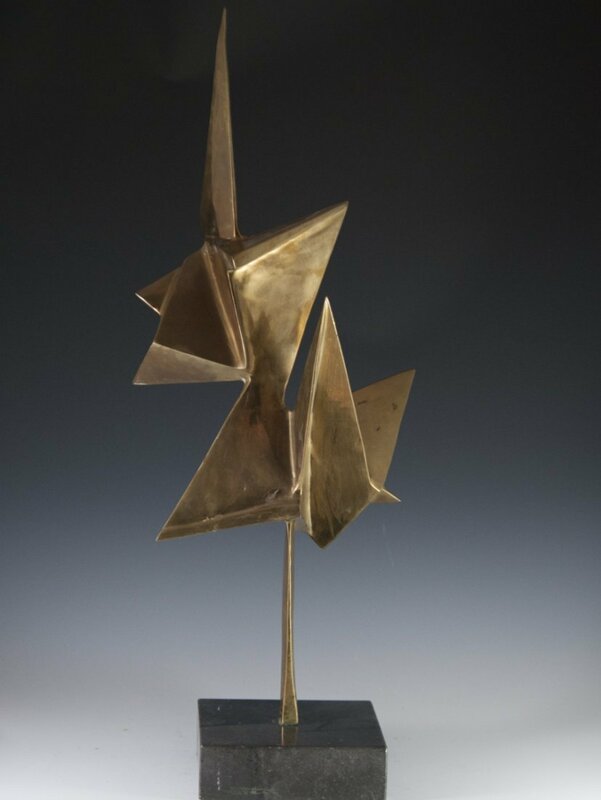 This exquisite bronze sculpture titled:”Sensacion de Vuelo” features an abstract design in which Nierman attempts to depict the “Sensation of Flight”. Decorated in a metallic gilded hue and signed:”Nierman I/VI”. Includes original certificate of authenticity from the artist himself. Leonardo Nierman was born in Mexico City, 1932. Throughout his urban upbringings in the city, Nierman wanted to begin an artistic career in Music but took on abstract painting and sculpture instead. Although taking on art, Nierman sees many similarities between music and art and often blends them together, as seen in many of his artworks that depicts abstract violins amongst astral back drops. Nierman’s first exhibition was at the Centro de Deportes Israeli in Mexico City, invited by Raquel Tibol. Two paintings were eventually sold of his, which highly motivated him to continue as an artist dwindling in career starting anxiety. Once these two paintings were purchased, they were seen by the owner of the IFA Gallery in D.C. who since 1959, has exhibited his work. Since then, he has had over 100 exhibitions in the Americas, Asia, Australia and Europe. 1964-Receives the Mexican Contemporary Art Prize, Art Institute of Mexico, Mexico, D.F. 1975 Exhibitions: Museum of Contemporary Art, Bogota, Columbia Merrill Chase Galleries, Chicago,Illinois B. Lewin Galleries, Los Angeles,Cal. 1987 Exhibition: Merrill Chase Galleries,Chicago,Ill. Museo de Arte Costarricense, C.A. 1988-Art Center Galleries – Hawaii Inc. “FLARE OF HOPE” Bronze for the Birmingham Museum of Art Alabama. “PEACE” bronze for the Mexican National University,Mexico, City “FLAME OF WISDOM” stainless steel Sculpture for the Yeshiva University, New York,N.Y. “GUBELIN” for the Hebrew University of Jerusalem – Sherman Building, Mount Scopus.